shawms and other instruments going with wind." 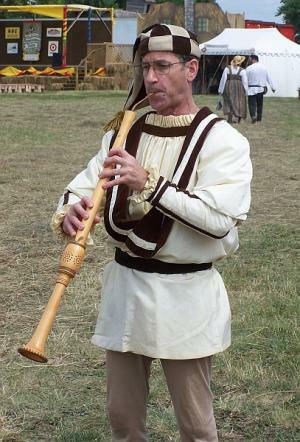 Unlike the medieval shawm, the late Middle Ages and Renaissance shawm uses a broad cane reed controlled by the player's lips. 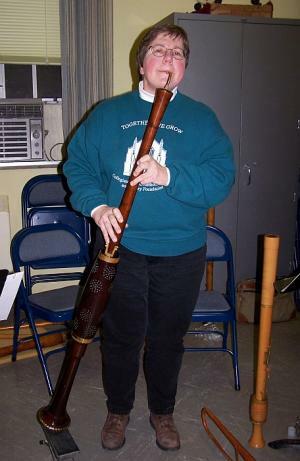 With the smaller size shawms, the reed could be placed inside a pirouette, a funnel shaped protector against which the player places his lips. This pirouette not only protects the reed, but also helps avoid lip fatigue. "Clown: Why, masters, have your instruments been at Naples, that they speak i' th' nose thus? 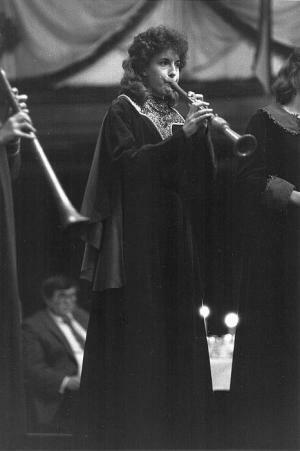 Clown: Are these, I pray, call'd wind instruments? Musician: Ay, marry, are they, sir. Clown: O. therey hangs a tail. Clown: Marry, sir, by many a wind instrument that i know. But, masters, here's money for you; and the General so likes your music, that he desires you, of all loves, to make no more noise with it." 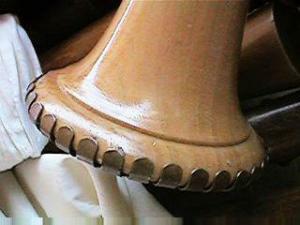 All shawms have several vent holes between the hole for the lowest note and the end of the bell. This section of the instrument is very long and contributes to the tone and carrying power of the instrument. A large fontanelle protects the key mechanism of the lowest note(s), and the crenellated metal band often found wrapped around the bell not only helps protect the instrument but also helps make the shawm a sturdy weapon for settling disputes among town musicians. Musica Antiqua's shawms include a soprano in c1 by Hermann Moeck, two altos in f by Moeck, a tenor in c by Moeck, a soprano in c1 by John Hanchet, and an alto in f by Collier.